If the National Security Administration's sophisticated anti-terrorism software could be calibrated to zero in on the phrase "I wish Crossway would do this," imagine how many e-mails, blog posts, and telephone calls would be intercepted. They'd have to hire extra staff. 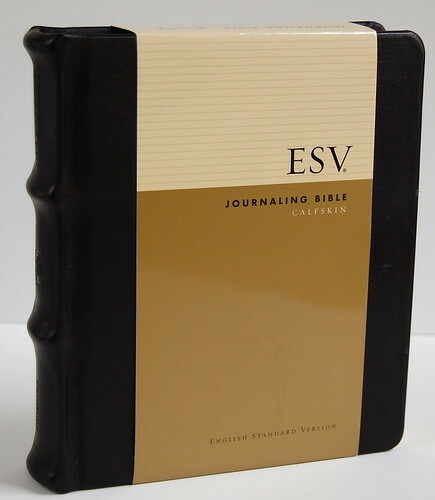 Considering how recent a translation the ESV is, it has a lot of fans. And some of us are, for lack of a better word, obsessive. We focus in on details most people would never notice. We are demanding. As a result, we tend to dwell on what's wrong and sometimes lose sight of what isn't. At any rate, I do. One thing Crossway has done a fantastic job of is offering its editions in a variety of covers. The original Classic Reference setting, for example, is now available in more than a dozen editions. There are over twenty thinline editions to choose from. You even get two options on metal-bound ESVs, choosing between the sleek refinement of "brushed aluminum" or the grungy authenticity of "weathered metal." 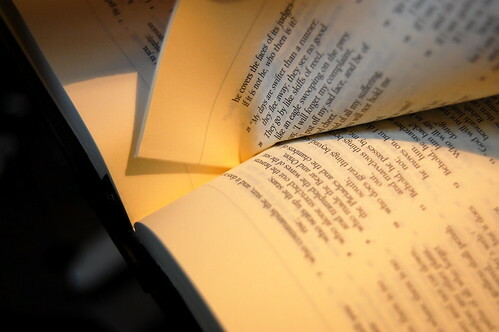 The Journaling Bible is no different. My money's always going to be on the original, Moleskine-inspired edition, which I've reviewed here. 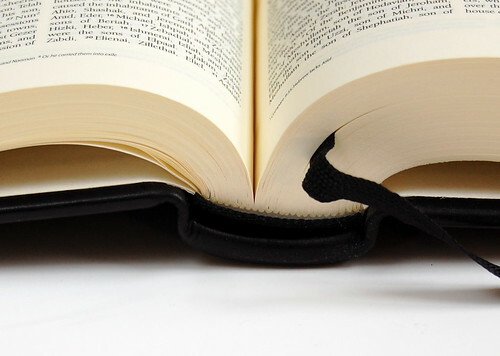 But if that doesn't float your boat, there are four other options to choose from -- a plum hardcover, a terracota/sage hardcover with elastic strap, a brown leather flap-and-strap cover, and the black calfskin featured here. It took me awhile to realize just how magnificent the black calfskin hardback is, because I was blinded by the original edition. As I mentioned in my original review, the Moleskine-cover option emerged from an idea I pitched to Crossway several years ago. For the first -- and so far only -- time in my life, I brought a Bible idea to a publisher and, after putting some thought into it, they responded with a new product. My idea was to put an ESV New Testament, as is, inside a Moleskine cover, so I can't take credit for the whole Journaling Bible concept. 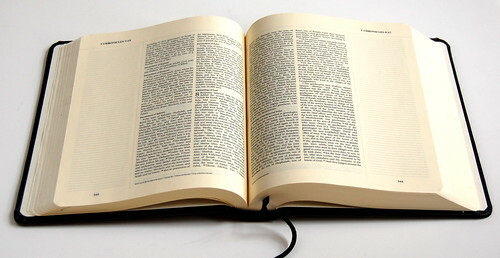 Still, I wanted a Bible that looked like a Moleskine ... and got one. So I didn't really warm to the other options at first. Why would you want a sage and terracotta hardback when there was a black one? Why would you want a wraparound leather flap? Moleskines don't have those, so why should you? When I was asked to suggest other cover options, I made a predictable suggestion: why not a red hardback with elastic strap, to mirror the new red Moleskines? Yes, I know. I'm a broken record. So what happened to change my mind? A trip to the bookstore. Over the holidays, I found myself trolling around in section at Barnes & Noble dedicated to journals. Variety is the spice of life, and in spite of my crush on the little black notebooks, I found myself checking out the competition. There were a lot of interesting options out there. Lots of brown leather journals with wraparound flaps. 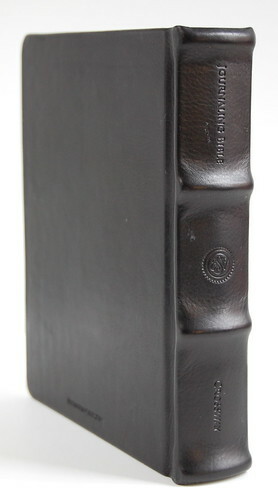 Some black leather hardbacks with exaggerated raised bands. Where had I seen these options before? Oh, right. The Journaling Bible. Is the binding glued or sewn, or a hybrid of the two? I'm no expert, but I'd love to know. 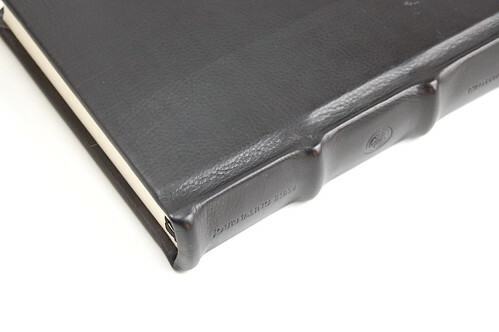 If the Journaling Bible is your thing, but the Moleskine look isn't, this black calfskin hardback strikes me as an elegant alternative. It comes a premium, since this edition retails for more than twice than the original. But I have to say, as much as I like the original, in this case the extra money might just be worth it.